ww2dbaseTakeichi Nishi was born in Azabu district, Tokyo, Japan as the third son of politician Danshaku (Baron) Tokujiro Nishi; he succeeded his father's danshaku title at the age of 10 when his father died. He enrolled in the Tokyo First Junior High School (now Hibiya High School) in 1915, Hiroshima Army Cadet School in Sep 1917, Tokyo Central Cadet Academy in 1920, and the Imperial Japanese Army Academy in 1920. 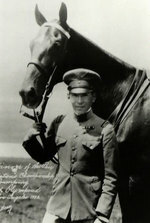 He graduated from the Imperial Japanese Army Academy in 1924 and was attached to the First Cavalry. In 1930, while on a trip in Italy, he bought the horse Uranus, with which he took to several horse riding competitions in Europe. In 1932, he won a gold medal at the 1932 Olympics at Los Angeles, United States, in show jumping individual, giving "Baron Nishi" a celebrity status in Los Angeles. After his return to Japan, he was assigned to the 16th Narashino Cavalry Regiment and was a cavalry instructor at the regimental school. He competed in the 1936 Olympics in Berlin, but did not complete the course due to a fall, allowing a German rider to win gold; some speculate that it was done for the greater good of his country, which was becoming closer to Germany diplomatically. After returning from Berlin, he was assigned to the Tokachi Subdivision of the department responsible for supply of military horses. In the late 1930s, he was assigned as the commander of the 26th Tank Regiment in Mudanjiang, Manchuria, China. He was promoted to the rank of lieutenant colonel during the Second Sino-Japanese War while in Manchuria. ww2dbaseIn 1944, the 26th Tank Regiment was assigned to Iwo Jima. En route, on 18 Jul 1944, the unit's transport was struck by a torpedo fired by American submarine Cobia, killing two men and sinking all 28 tanks. He made a trip to Tokyo to secure 22 replacement tanks for his unit, and made a side trip to see Uranus in Setagaya Ward of Tokyo; "Few people comprehended him and only Uranus understood him", noted biographer Kaoru Ono. In Tokyo, he set up his regimental headquarters near the village of Maruman. Many of his tanks were dug entrenched behind sandbags as fixed fortifications against the Americans. The Americans, knowing Nishi's presence on Iwo Jima, broadcasted daily propaganda messages asking him to surrender, telling him that Americans would regret losing the beloved celebrity "Baron Nishi". He was killed during the last days of the Battle of Iwo Jima some time in late Mar 1945. Like most Japanese fighting on Iwo Jima, the exact cause of his death was unknown. ww2dbaseNishi was posthumously promoted to the rank of colonel and was enshrined at the Yasukuni Shrine in Tokyo. Uranus, which died one week after Nishi, was commemorated at the War Horse Memorial at the History and Folklore Museum in Honbetsu, Hokkaido, Japan in 1990. 12 Jul 1902 Takeichi Nishi was born. 22 Mar 1945 Takeichi Nishi passed away. I saw yesterday the film Letters of Iwojima.I believe Baron Takeidi Nishi was a great officer and also personality.Also his horse Uranus will be both remembered.R.I.P.